Order a beautiful Angel Memorial – a remembrance for your child. 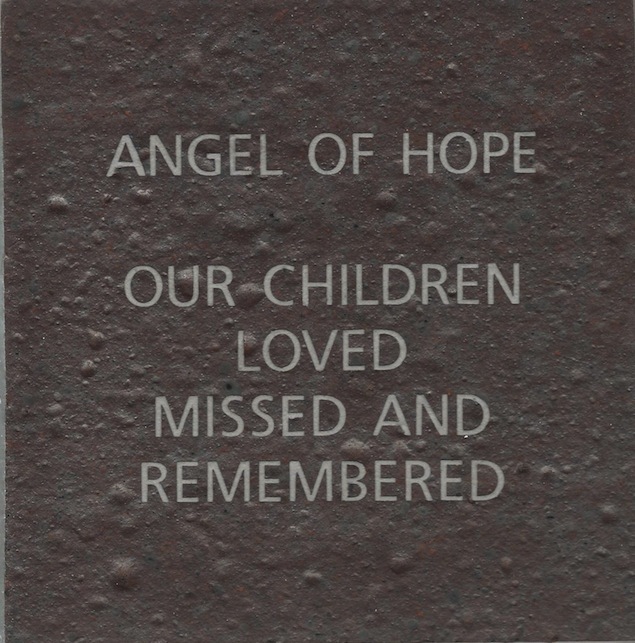 This beautiful memorial tile will last a life time – custom engraved in memory of your child. Please click here to download, and print the form to order your tile. Children’s names are commemorated on the Wall of Love located behind the angel statue. Memorial tiles will be placed on the wall annually in time for the December 6th candlelight remembrance ceremony. Memorial tile orders must be received by May 15th each year to be included on that year’s update. The Children’s Memorial Park Angel of Hope, continues to accept donations to cover expenditures such as expenses associated with the Annual Candlelight Remembrance Ceremony, ongoing landscape costs, and general site maintenance. You may make your contribution in memory of a child. Donations to the Children’s Memorial Park can be made payable to the City of Virginia (note “Children’s Memorial Park” in the memo line). Your gift is tax-deductible to the fullest extent of the law. Thank you for your support.